Melaleuca leucadendron , var. coriacea Poir. 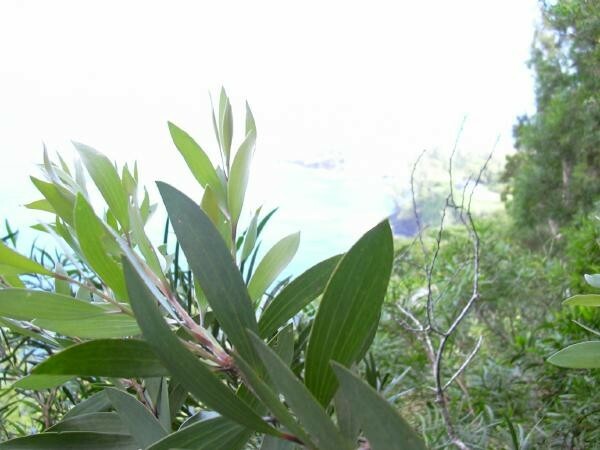 Melaleuca leucadendron , � angustifolia L.f.
Melaleuca viridiflora , var. angustifolia L.f.
Melaleuca can reach 25 meters in height and grow to 90 centimeters in diameter. 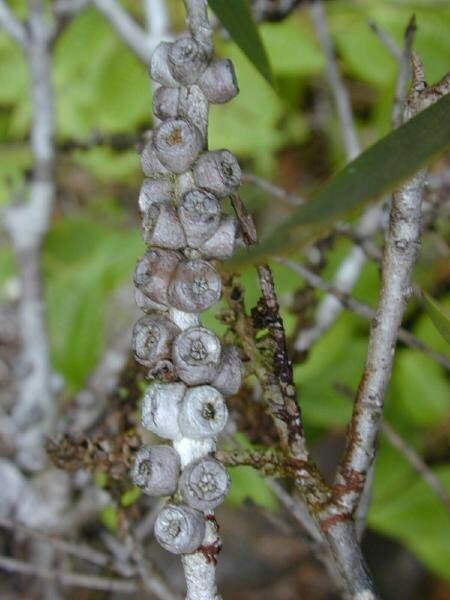 It is easily recognised by its spongy flaking bark (white, cream, orange-cream, fawn-grey or dark grey in colour (Craven, in press), lanceolate five-veined leaves, and clusters of woody seed capsules (Laroche 1999). Its white papery bark resembles birch and its white flower clusters resemble bottlebrush (Gioeli & Neal 2004). Its white tufted inflorescences are indeterminate, two to five centimeters long and arranged in bottlebrush-like spikes (Holliday 1989, in Center et al. 2006). Flowers of M. quinquenervia, like most Myrtaceae, have numerous stamens on a cup-shaped hypanthium surrounding the ovary. Myrtaceae leaves are simple and entire and the plants are usually aromatic (Laroche 1999); some have an intense citrus-like or eucalyptus oil odour when crushed (FLEPPC Undated).Within the spike-like inflorescence, flowers are clustered in threes; and secrete nectar, which collects within the base of the hypanthium; the stamens are arranged in five bundles each bundle consisting of five to ten fused stamens; the petals and filaments are usually white or creamish (Laroche 1999, L. Craven, pers. comm.). The capsular fruits, 2.7-4mm long, may persist for several years (Meskimen 1962, in Center et al. 2006). Please see the Melaleuca Management Plan 1999) for botanical illustrations of M. quinquenervia (page 10). M. quinquenervia is part of the broad-leaved Melaleuca leucadendra-complex, which contains 15 species that are endemic to the Australian-Tasmanian region (Craven 1999, in Wineriter et al. 2003). The name Melaleuca comes from the Greek, meaning black and white, presumably referring to the white bark, often charred black by fire (Debenham, 1962, in Turner et al. 1998). Melaleuca trees may reach 90 years and still remain fertile (Serbesoff-King 2003). Seedling and Sapling Stages: Seedlings appear to be less tolerant of harsh environmental conditions than are the seeds (Woodall 1983, in Turner et al. 1998). Melaleuca seeds germinate upon moist soils, usually within a few days of wetting, and may remain viable up to six months under water or in wet soils (Meskimen 1962, Myers 1975, in Laroche 1999). Seeds may germinate while completely inundated (Lockhart 1995, in Laroche 1999). Meskimen (1962, in Laroche 1999) found a trend for germination to occur more in sun than in shade. Rarity of seedlings within dense stands of melaleuca may be from either shading or allelopathic effects of melaleuca litter (DiStefano & Fisher 1983, in Laroche 1999). Seedlings less than several weeks or months old may die from fire or if soils are dry (Myers 1975, 1983) Droughts severe enough to lower the water table by one meter will also kill the seedlings (Woodall 1981a, in Turner et al. 1998). Seedlings are also less tolerant of fires, as they have a thinner, insulating bark layer (Woodall 1981a, in Turner et al. 1998). Soon after seedlings are able to withstand extreme conditions ranging from fire to total immersion for months (Meskimen 1962, in Laroche 1999). Young saplings and seedlings respond to inundation by changing leaf shapes. Leaves become more linear when meristems are deeply flooded, and more rounded when the meristem is nearer to the water surface (Laroche 1999). This adaptation may enable better light or nutrient utilisation, or help the saplings to survive flooding (Lockhart, 1996). Worldwide, many of the 4000-5000 Myrtaceae species are cultivated as ornamentals or as sources of fruits, spices, aromatic oils or timber (Laroche 1999). The thick, spongy bark has historically been used as fruit-packing, bedding material and insulation (von Mueller 1888, Morton 1966, in Dray Bennett & Center 2006). Ornamental/landscaping: Melaleuca spp. are often planted as ornamentals, for screening, for their interesting bark and for their showy flowers (Turner et al. 1998). The small crown and distinctive bark have made it a popular ornamental tree (Greary Undated). It is widely cultivated for erosion control, windbreaks and watershed cover (Little & Skomen 1989, in Munger 2005). Wood products: The medium-density wood is difficult to season and tends to warp, but it finishes well as a cabinet wood (Greary Undated). Without preservative treatment it makes a poor fence post and a major deterrent to use is the high bark-to-wood ratio (Greary Undated). Melaleuca has been used extensively for carpentry and joinery work and is used for structural timber, fuel, pulpwood and insulation/stuffing and for traditional dwellings in its native New Caledonia. The bark is useful for its insulating properties and as a mulch and potting medium (Greary Undated; Brown & Duke 2000, in Munger 2005). Cutting and chipping operations are currently utilising melaleuca wood for landscape mulching and boiler fuel in Florida (Stocker 1999). Honey-making: In Florida, the abundant flowering crop has been important to the apiary industry to sustain bee colonies and as a source of honey (Greary Undated). While melaleuca is believed to be an important component of Florida's beekeeping industry (a source of nectar for honey, package bees, and wax) there are no indications that flowers are a limiting factor for bees (Diamond et al. 1991, in Laroche 1999). Essential oils: Essential oils are extracted from its leaves, twigs and seeds by hydrodistillation from plantations in New Caledonia (Doran & Turnball 1997, Doran 1999 in Ireland 2002) and Madagascar (Ramanoelina et al. 2008). Essential oils constitute a principal antiseptic component in some commercial disinfectants (Dray et al. 2006). In its native range melaleuca occurs in seasonally and permanently inundated wetlands along the eastern coast of Queensland and New South Wales, Australia (11ºS to 34ºS) (Holliday 1989, in Burrows & Balcunas 1997; Boland et al. 1987, in Center et al. 2006). Australian habitats that support melaleuca populations include low-lying coastal wetlands behind heath-dominated headlands, riparian zones, brackish estuaries, mangrove swamps (Rayamajhi et al. 2002), Melaleuca swamp forest, monsoon scrub, littoral rainforest, grassland, open forest, low shrubland on coastal dunes and lagoon margins (Craven, In press). In its invaded territories, melaleuca can infest relatively drier areas (Buckingham 2000) and invades a variety of forested and non-forested natural communities, including: freshwater marshes, wet grasslands, sawgrass prairies, disturbed cypress forests, wet pine flatwoods, Miami rock ridge pinelands, longleaf-slash pine, hardwood hammocks, salt marshes and mangroves. In general, xeric communities such as scrub tend to be resistant, but not immune, to melaleuca invasion (Laroche 1999). Favourable moisture conditions are found in pine flatwood depressions and the broad ecotones where pine and dwarf pond cypress mix (Duever et al. 1986, in Munger 2005). Melaleuca is tolerant of fire, seasonal drought and seasonal flooding (see Gomes & Kozlowski 1980; Geary & Woodall 1990). Melaleuca can grow in sites that are nutrient-poor such as pine savannas or wet prairies (Woodall 1981) due to its ability to send vertical roots straight down to the water table (Munger 2005). 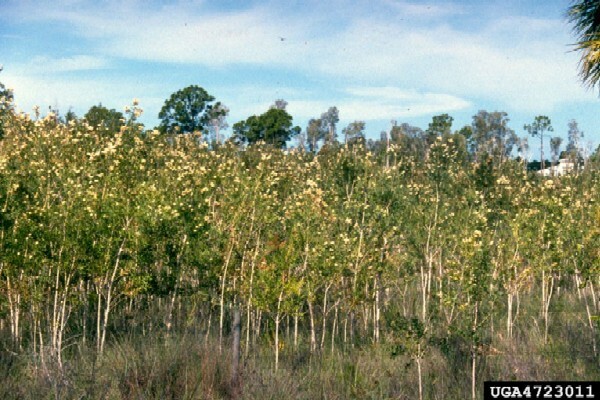 As observed in Florida, Pratt (2005b) suggests wetlands that experience moderate to short hydroperiods are the most vulnerable to invasion by melaleuca. Melaleuca invades disturbed land such as abandoned farmlands, depressions in stump-harvested pinelands, road/canal wetland construction sites, improved pasture, natural rangeland and urban areas (Duever et al. 1986, Myers 1983 1984, in Munger 2005). Undisturbed ecosystems can be resistant, but not immune to, melaleuca invasion (Ewel et al. 1976, in Laroche 1999); however, in south Florida melaleuca has invaded essentially every existing community (Laroche 1999). In Australia melaleuca occurs on sand, sandy loam, sandstone, laterite over sand, silty soil and serpentine substrates (Craven, In press), in New Guinea on highly organic, alluvial clays and in New Caledonia on well-drained slopes, ridges in the uplands (Geary Undated) and on flat, poorly drained soils (L. Craven, pers. comm.). Melaleuca establishes best on sandy soils but it can survive on nearly any soil type in south Florida (Ewel 1986, Hofstetter 1991, in Munger 2005). It is commonly found in Everglades ecosystems characterised by high organic soils (Pratt et al. 2004) or limestone-derived soils (Geary & Woodall 1990). Although melaleuca is found in soils of high pH plants may perform better in slightly acidic soils (Kaufman 1999, in Munger 2005). Melaleuca in Hawaii grow well on calcareous beach sand and on soils derived from basalt ash and lava rock of pH 4.5–5.5 (Geary 1998, in Geary Undated). According to Woodall (1981) a map of soil pH cannot be used to predict melaleuca invasion. In its native habitat melaleuca is found mainly from sea level to 100m, but occasionally at elevations of 1000m (Geary Undated). Most of southern Florida, where melaleuca readily invades, is less than 8m above sea level (Geary & Woodall 1990). In its native habitat mean annual rainfall ranges from 900–1250 mm; mean monthly temperatures range from 5°C –32°C and in the southernmost part of its range, a few light frosts occur per year (Geary Undated). Where frequent freezing temperatures become common, melaleuca becomes less invasive (Munger 2005).The tree grows successfully in its introduced range where rainfall is 5000mm and a winter maximum occurs (Geary 1998, in Geary Undated). Melaleuca trees may flower within three years of germination, sometimes in the first year, and produce seed as many as five times per year (Meskimen 1962, in Laroche 1999; Meskimen 1962, in Turner et al. 1998). In Florida, synchronised flowering events occur during winter (from November to January) and to a lesser degree in the summer (although a small proportion may reproduce at non-synchronised intervals) (Meskimen 1962). Bursts of vegetative growth generally occurring after flowering (between January and February) (Laroche 1999). In wet years, flowering and growth can be extended from July to April to with several flowering cycles (Laroche 1999). The number of capsular fruit produced per centimeter of infructescence is greater among populations in it's introduced range (eg: Puerto Rico and Florida) than in it's native range (Pratt et al. 2005b; Pratt et al. 2007). Reproduction occurs along flower-bearing branch segments; persistent capsular fruits arise from flowers and are arranged in clusters, which may remain attached to the trunks, branches or twigs for up to ten years (Laroche 1999; Meskimen 1962, in Center et al. 2006). Melaleuca has two reproduction possibilities due to the fact that seed retention extends beyond seed ripening; first, a low-level, virtually continuous seed release ensures that at least some of the seeds on the ground near the tree will be fresh, thus allowing the species to exploit all reproduction opportunities no matter how short they are in duration; second, retention of seeds allows for a potential mass seed release if some natural catastrophe kills the tree (Woodall 1983, in Laroche 1999). Melaleuca is an extremely prolific seed producer. Capsules each contain 200 to 350 minute seeds (Meskimen 1962), and the canopy of a 21 meter high tree may produce 34 kg of mature capsules that contain up to 100 million seeds (Rayamajhi et al. 2002b, in Serbesoff-King 2003; Van Rayamajhi & Center 2005). Studies have shown that of these 10% to 15% contain embryos and of these embryonic seeds 62% are viable (Rayachhetry et al. 1998 , in Serbesoff-King 2003), giving a total potential 9 million viable seeds per mature large tree; and one hectare may store as many as 25 billion seeds; this represents a massive canopy-held seed bank (Rayamajhi Unpub. Data, in Center at al. 2006). Results from seed burial tests indicate that seed viability is decreased by about 50% after eight months in the soil (Laroche 1999). Most buried seeds lose viability after about 1.5 years at seasonally flooded and permanently flooded sites, whereas seeds buried at non-flooded sites survived over a period up to 2 to 2.3 years (Van, Rayamajhi and Center 2005). The seed capsule must be dry before the seed will be released; anything that disrupts vascular connections thereby causing the capsules to desiccate and open will stimulate melaleuca seed release (Center et al. 2006). Desiccation can be caused by stem growth, cutting or breaking of the stem, fire damage, frost damage, self pruning due to shade, natural death of the tree or herbicide application (Laroche 1999; Woodall 1982, in Munger 2005). Melaleuca trees resprout and coppice readily (Conde et al. 1981, Hofstetter 1991, in Serbesoff-King 2003) following man-made cutting or natural damage. Extensive rooting and sprouting can occur from a fallen or cut tree (Serbesoff-King 2003). Melaleuca logs used as fence-posts frequently sprout new growth (Laroche 1999; Munger 2005). Melaleuca is pollinated by a variety of insects, most commonly honeybees, however, seed fertility is low. Pollination within the same flower results in reduced fruit set compared with pollination between flowers, promoting out-crossing. Flowering and seed production are less on shaded branches than on emergent canopy branches (Meskimen 1962, in Munger 2005). Melaleuca quinquenervia has been internationally disseminated over the course of the last century for ornamental, revegetation, and agroforestry purposes (Turner et al. 1998, Serbesoff-King 2003, Dray 2003, in Pratt et al. 2005b). Principal source: Pacific Island Ecosystems at Risk (PIER). 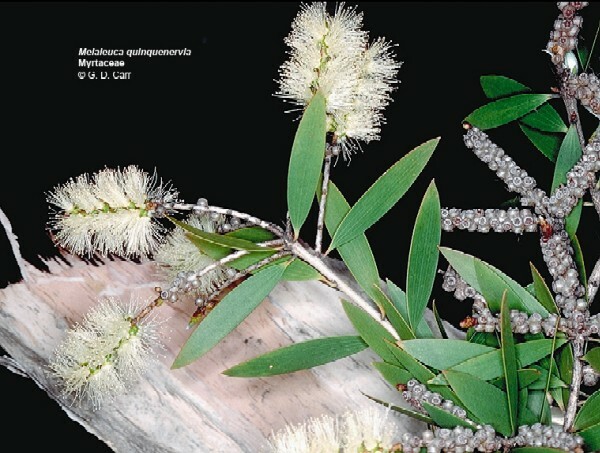 Recommended citation: Global Invasive Species Database (2019) Species profile: Melaleuca quinquenervia. Downloaded from http://www.iucngisd.org/gisd/species.php?sc=45 on 22-04-2019. For a detailed account of the impacts of M. quinquenervia please read: Melaleuca quinquenervia (Broad-Leaved Paperbark) Impacts Information. The information in this document is summarised below. Melaleuca is the most problematic invasive plant species in Florida because of its wide distribution range, prolific seed production and potential impact on human health (Fuller 2005). Melaleuca threatens the preservation of critical wildlife habitat in southern Florida including in the Florida Everglades National Park. Despite control efforts melaleuca still occurred in around 170 000 hectares of southern Florida in 1997, representing 6% of the total region (Bodle & Van 1999, in Rayamajhi et al. 2007; Laroche 1999). Ecosystem Change: Melaleuca threatens the integrity of subtropical freshwater ecosystem processes in Florida (Dray & Center 1994, in Lopez-Zamora Comerford & Muchovej 2004) by altering soil chemistry, reducing de-composition rates and modifying hydrology and fire regime. Melaleuca also reduces species biodiversity and alters species composition. Reduction in Native Biodiversity: Melaleuca forests provide limited food and habitat value for native wildlife and can reduce indices of native species in Florida wetlands by as much as 80% (Dray et al 2006; Bodle et al., 1994, O’Hare & Dalrymple, 1997, in Dray et al. 2009; Porazinska Pratt & Giblin-Davis 2007). Decreases in diversity of native plant biodiversity have also been linked with melaleuca in the Bahamas. Habitat Alteration: Melaleuca is contributing to significant habitat loss in the Everglades National Park by converting fire-maintained sawgrass communities into Melaleuca forest (Turner et al. 1998, in Munger 2005). 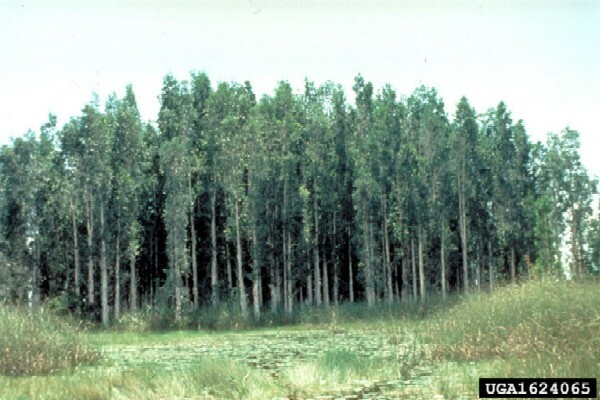 Displacement: Melaleuca displaces pond cypress (Taxodium ascendens) (Myers 1975 1983, Ewel 1986, in Rayamajhi et al. 2008b), slash pine (Pinus elliottii) and sawgrass (Cladium jamaicensis) (Bodle et al., 1994, in Tipping et al. 2008). Competition: Melaleuca is competitively superior to most native vegetation occurring in the Florida Everglades (Turner et al. 1998, in Pratt et al. 2005b). It is fire-adapted, herbivore-adapted and produces seeds and roots prolifically. Inhibits the Growth of Other Species: Allelochemicals present in roots can have a detrimental effect on the soil biota (Porazinska Pratt & Giblin-Davis 2007). Economic:Balciunas and Center (1991, in Serbesoff-King 2003) reported that by the year 2010, close to $2 billion would be lost due to the melaleuca invasion in southern Florida. Financial losses included $1 billion in tourism to the Everglades NP, $250 million in tourism to the rest of south Florida, $250 million in recreation, $250 million due to fires, $1 million in control efforts, $10 million due to loss of endangered species and $1 million to nursery growers. Agricultural: In one study 18 economic arthropod pests were collected from M. quinquenervia (Costello et al. 2008). Human Health: As melaleuca populations expand in southern Florida and the human population increases the risk of fire and loss of human life and property increases (Laroche 1999). Modification of Hydrology: A stand of melaleuca may transpire more water than the sawgrass communities it replaces (Hofstetter 1991a, in Laroche 1999). Modification of Fire Regime: Ground fires, high temperatures, rapid spread rates and abundant smoke, all present in burning melaleuca stands, present new risks for wildlife in the Everglades wetlands (Flowers 1991, in Laroche 1999). Modification of Nutrient Regime: The rate of decomposition of melaleuca litter is slower than that of native plants (Van & Rayamajhi, Unpub. Data, in Rayamajhi et al. 2006b). For a detailed account of managment of M. quinquenervia please read: Melaleuca quinquenervia (Broad-leaved Paperbark) Management Information. The information in this document is summarised below. Current management methods for melaleuca include herbicides, manual removal of plants, prescribed fires and bio-control. Preventative Measures: Preventative measures are the best form of weed control. Education on the potential threats posed by melaleuca on invaded ecosystems should be targeted at the nursery industry and the general public. Monitoring and Mapping: Model projections suggest there is considerable scope for further invasion of melaleuca under current climate conditions, with the highest risk areas occurring in Southeast Asia, the Caribbean, South and Central America and the Gulf coast in southern USA. Physical:\nMechanical removal using heavy equipment is not appropriate in most natural areas because of disturbances to soils and non-target native vegetation; however, this method of control can be applied along canal and utility rights-of-way (Laroche 1999). Physical: Physical methods also include the use of prescribed fire and of flooding More information is needed on the timing of prescribed burning, and constraints to this method include impacts on non-target species, the triggering of mass seed release by trees and liability concerns (Turner et al. 1998). Chemical/Herbicidal Control: Exotic woody vegetation is most frequently managed by herbicides (Laroche 1999). Hexazinone and tebuthiuron are most effective in the control of melaleuca (Laroche 1999), however, they are no longer allowed to be applied directly to water in Florida (Laroche 1998a, in Serbesoff-King 2003). Current chemical control recommendations for melaleuca include low volume applications of glyphosate for control of saplings, and aerial or individual stem (girdle) applications of imazapyr alone, or in combination with glyphosate for mature trees (Langeland and Stocker 1997, in Stocker 1999). Integrated management: As a result of the implementation of the integrated Melaleuca Management Plan 1999 almost 100 000 acres of natural area have been cleared of melaleuca (Laroche 1994). The Areawide Management Evaluation of Melaleuca quinquenervia (TAME) aims to demonstrate the effectiveness of integrated control of melaleuca in invaded habitats in the United States and elsewhere. Informations on Melaleuca quinquenervia has been recorded for the following locations. Click on the name for additional informations. Buckingham, Gary R. 2001. Quarantine host range studies with Lophyrotoma zonalis, an Australian sawfly of interest for biological control of melaleuca, Melaleuca quinquenervia, in Florida, BioControl (Dordrecht) 46(3): pp. 363-386. Burrows, D.W. and Balciunas, J.K. 1997. Biology, distribution and host-range of the sawfly, Lophyrotoma zonalis (Hym. Pergidae), a potential biological control agent for the paperbark tree, Melaleuca quinquenervia, Entomophaga 42(3): pp. 299-313. Center, T.D., P.D. Pratt, P.W. Tipping, M.B. Rayamajhi, T.K. Van, S.A. Wineriter, F.A. Dray, Jr. & M. Purcell. 2006. Field colonization, population growth, and dispersal of Boreioglycaspis melaleucae Moore, a biological control agent of the invasive tree Melaleuca quinquenervia (Cav.) Blake, Biological Control 39(3): pp. 363-374. Center, T.D., Pratt, P.D., Tipping, P.W., Rayamajhi, M.B., Van, T.K., Wineriter, S.A. & Dray Jr., F.A. 2007. Initial impacts and field validation of host range for Boreioglycaspis melaleucae Moore (Hemiptera: Psyllidae), a biological control agent of the invasive tree Melaleuca quinquenervia (Cav.) blake (Myrtales: Myrtaceae: Leptospermoideae), Environmental Entomology Volume 36(3): pp. 569-576. Cofrancesco, A.F., Jr. ; Wooten, J.W. ; Jones, H.L. 1995. Evaluation of Mechanical and Chemical Methods for Control of Melaleuca quinquenervia in Southern Florida. Wetlands Research Programs. Final Report. Army Engineer Waterways Experiment Station Vicksburg MS.
Costello, S.L., Pratt, P.D., Rayamajhi, M.B. & Center, T.D. 2003. Arthropods associated with above-ground portions of the invasive tree, Melaleuca quinquenervia, in south Florida, USA, Florida Entomologist Volume 86(3): pp. 300-322. Davies, K.A, Makinson, J., Purcell, M.F. 2001. Observations on the development and parasitoids of Fergusonina/Fergusobia galls on Melaleuca quinquenervia (Myrtaceae) in Australia, Transactions of the Royal Society of South Australia 125(1): pp. 45-50. Summary: The gall-forming Fergusonina/Fergusobia association is being considered as a potential biocontrol agent of Melaleuca quinquenervia in Florida, where it has become a serious weed. This paper reports observations on the development of Fergusonina/Fergusobia galls on M. quinquenervia in coastal and sub-coastal south-eastern Queensland and northern New South Wales. The morphology of the gall and the relationship between gall size and numbers of developing cavities and insects are described. Nematodes were found in cavities containing first and second or early third stage fly larvae. Eight species of hymenopteran parasitoids were reared from galls. Franks, S.J., Kral, A.M. & Pratt, P.D. 2006. Herbivory by introduced insects reduces growth and survival of Melaleuca quinquenervia seedlings Environmental Entomology 35(2): pp. 366-372. Fuller, D. O. 2005. Remote detection of invasive Melaleuca trees (Melaleuca quinquenervia) in South Florida with multispectral IKONOS imagery, International Journal of Remote Sensing 26(5): pp. 1057 - 1063. Gioeli, T.K. & A.S. Neal. 2004. Biological Control of in Florida s Natural and Man-made Landscapes, Proc. Fla. State Hort. Soc. 117: 254-255. Laroche, F.B. 1998. Managing melaleuca (Melaleuca quinquenervia) in the Everglades, Weed Technology 12(4): pp. 726-732. Myers, R.L., H.A. Belles & J.R. Snyder. 2001. Prescribed fire in the management of Melaleuca quinquenervia in subtropical Florida. Pages 132-140 in K.E.M. Galley and T.P. Wilson (eds.). Proceedings of the Invasive Species Workshop: the Role of Fire in the Control and Spread of Invasive Species. Fire Conference 2000: the First National Congress on Fire Ecology, Prevention, and Management. Miscellaneous Publication No. 11, Tall Timbers Research Station, Tallahassee, FL. Available from: http://www.hear.org/pier/species/melaleuca_quinquenervia.htm [Accessed 5 February 2003]. Pratt, P. D., Slone, D. H., Rayamajhi, M. B., Van, T. K. & Center, T. D. 2003. Geographic distribution and dispersal rate of Oxyops vitiosa (Coleoptera: Curculionidae), a biological control agent of the invasive tree Melaleuca quinquenervia in south Florida, Environmental Entomology 32(2): pp. 397-406. Pratt, P. & Ferriter, A. 2001. Plan of Work for The Areawide Management Evaluation of Melaleuca quinquenervia (TAME Melaleuca). United States Department of Agriculture. Purcell, M. F. & Goolsby, J. A. 2005. Herbivorous insects associated with the paperbark Melaleuca quinquenervia and its allies: VI. Pergidae (Hymenoptera), Australian Entomologist 32: pp. 37-48. Summary: Surveys were conducted in Australia to find biological control agents for the broad-leaved paperbark tree, Melaleuca quinquenervia, a serious pest in Florida, USA. This paper presents collection records and biological information for five sawfly species: Acanthoperga cameronii (Westwood), Perga vollenhovii Westwood, Pergagrapta polita Leach, Pterygophorus insignis Kirby and Lophyrotoma zonalis (Rohwer); all in family Pergidae. One of these species, Lophyrotoma zonalis, was extensively studied as a biological control agent but concerns over its toxicity have delayed release. Rayachhetry, M.B., Elliott, M.L., Center, T.D. & Laroche, F. 1999. Field evaluation of a native fungus for control of melaleuca (Melaleuca quinquenervia) in southern Florida, Weed Technology 13(1): pp. 59-64. Rayamajhi, M.B., Van, T.K., Pratt, P.D. & Center, T.D. 2006a. Interactive association between Puccinia psidii and Oxyops vitiosa, two introduced natural enemies of Melaleuca quinquenervia in Florida, Biological Control 37(1): pp. 56-67. Rayamajhi, Min B., Pratt, Paul D., Center, Ted D., Tipping, Philip W. & Van, Thai K. 2008a. Aboveground biomass of an invasive tree melaleuca (Melaleuca quinquenervia) before and after herbivory by adventive and introduced natural enemies: A temporal case study in Florida, Weed Science 56(3): pp. 451-456. Scheffer, S. J., Giblin-Davis, R. M., Taylor, G. S., Davies, K. A., Purcell, M., Lewis, M. L., Goolsby, J., Center, T. D. 2004. Phylogenetic relationships, species limits, and host specificity of gall-forming Fergusonina flies (Diptera: Fergusoninidae) feeding on Melaleuca (Myrtaceae), Annals of the Entomological Society of America 97(6): pp.1216-1221. Serbesoff-King, Kristina. 2003. Melaleuca in Florida: A literature review on the taxonomy, distribution, biology, ecology, economic importance and control measures, Journal of Aquatic Plant Management 41: pp. 98-112. SFWMD (South Florida Water Management District). Undated. Miami-Dade County Lake Belt. Silvers, C.S., Pratt, P.D., Ferriter, A.P. & Center, T.D. 2007. TAME melaleuca: A regional approach for suppressing one of Florida s worst weeds, Journal of Aquatic Plant Management 45: pp. 1-8. Stocker, R.K. 1999. Mechanical harvesting of Melaleuca quinquenervia in Lake Okeechobee, Florida, Ecological Engineering 12(3-4): pp. 373-386. TAME (The Areawide Management Evaluation of Melaleuca quinquenervia). 2007. Tipping, P.W., Martin, M.R., Nimmo, K.R., Pierce, R.M., Smart, M.D., White, E., Madeira, P.T. & Center, T.D. 2009. Invasion of a West Everglades wetland by Melaleuca quinquenervia countered by classical biological control, Biological Control 48(1): pp. 73-78. Tipping, P.W., Martin, M.R., Pratt, P.D., Center, T.D., Rayamajhi, M.B. 2008. Suppression of growth and reproduction of an exotic invasive tree by two introduced insects, Biological Control 44(2): 235-241. Turner, C.E., Center, T.D., Burrows, D.W. & Buckingham, G.R. 1998. Ecology and management of Melaleuca quinquenervia, an invader of wetlands in Florida, USA, Wetlands Ecology and Management 5(3): pp. 165-178. Watt, M.S., Kriticos, D.J. & Manning, L.K. 2009. The current and future potential distribution of Melaleuca quinquenervia, Weed Research Volume 49(4): pp. 381-390. Wheeler, G.S. & Ordung, K.M. 2006. Lack of an induced response following fire and herbivory of two chemotypes of Melaleuca quinquenervia and its effect on two biological control agents, Biological Control 39(2): pp. 154-161. Wineriter, S.A., G.R. Buckingham & F.J. Howard. 2003. Host range of Boreioglycaspis melaleucae Moore (Hemiptera: Psyllidae), a potential biocontrol agent of Melaleuca quinquenervia (Cav.) S.T. Blake (Myrtaceae), under quarantine, Biological Control 27(3): pp. 273-292. American Bird Conservancy. 2007. Threats to Birds - Melaleuca (Melaleuca quinquenervia). Bodle, M.J., Ferriter, A.P. & Thayer, D.D. 1994. The biology, distribution, and ecological consequences of Melaleuca quinquenervia in the Everglades, Everglades: the ecosystem and its restoration: pp. 341-355. Cook, L.G., Morris, D.C., Edwards, R.D. & Crisp, M.D. 2008. Reticulate evolution in the natural range of the invasive wetland tree species Melaleuca quinquenervia, Molecular Phylogenetics & Evolution 47(2): pp. 506-522. Craven, L.A. 2006. New Combinations in Melaleuca for Australian Species of Callistemon (Myrtaceae). Novon, 16: 468-475. Craven, L. In press. Melaleuca. In Flora of Australia. Dray, F.A. Jr., Bennett, B.C. & Center, T.D. 2006. Invasion history of Melaleuca quinquenervia (Cav.) S.T. Blake in Florida, Castanea 71(3): pp. 210-225. Dray, F.A. Jr., Hale, R.E., Madeira, P.T., Bennett, B.C. & Center, T.D. 2009. Concordance between life history traits, invasion history, and allozyme diversity of the Everglades invader Melaleuca quinquenervia, Aquatic Botany 90(4): pp. 296-302. Florence J., Chevillotte H., Ollier C.,& Meyer J.-Y. 2007.Melaleuca quinquenervia. Base de donn�es botaniques Nadeaud de l Herbier de la Polyn�sie fran�aise (PAP). Geary, T. F. & Woodall, S. L. 1990. Melaleuca quinquenervia (Cav.) S. T. Blake melaleuca. In: Burns, Russell M.; Honkala, Barbara H., tech. coords. Silvics of North America. Vol. 2. Hardwoods. Agric. Handb. 654. Washington, DC: U.S. Department of Agriculture, Forest Service: 461-465. Geary, T. Undated. 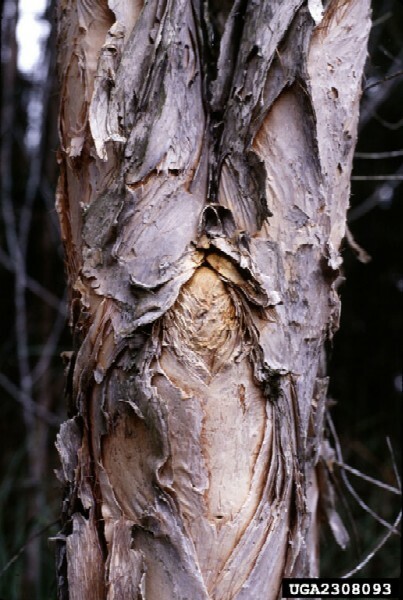 Part II-Species Descriptions: Melaleuca quinquenervia (Cav.) S.T. Blake: pp. 567-568. Gomes, A.R. Sena and T.T. Kozlowski. 1980. Flooding effects on Melaleuca quinquenervia: Responses of Melaleuca quinquenervia seedlings to flooding, Physiol. Plant 49: pp. 373-377. Ireland, B.F., Hibbert, D.B., Goldsack, R.J., Doran, J.C. & Brophy, J.J. 2002. Chemical variation in the leaf essential oil of Melaleuca quinquenervia (Cav.) S.T. Blake. Biochemical Systematics and Ecology, 30(5): 457-470. Kaufman, S. and Smouse, P. 2001. Comparing indigenous and introduced populations of Melaleuca quinquenervia (Cav.) Blake: response of seedlings to water and pH levels, Oecologia 127: pp. 487-494. Lopez-Zamora, I., Comerford, N.B. & Muchovej, R.M. 2004. Root development and competitive ability of the invasive species Melaleuca quinquenervia (Cav.) S.T. Blake in the South Florida flatwoods, Plant and Soil 263: 239-247. Mazzotti, F.J., Center, T., Dray, F., Thayer, D. 1997. Ecological Consequences of Invasion by Melaleuca quinquenervia in South Florida Wetlands: Paradise Damaged, not Lost. Wildlife Ecology and Conservation Department, University of Florida. Munger, Gregory T. 2005. Melaleuca quinquenervia. In: Fire Effects Information System, [Online]. U.S. Department of Agriculture, Forest Service, Rocky Mountain Research Station, Fire Sciences Laboratory (Producer). Summary: NatureServe Explorer: An online encyclopedia of life [web application]. Version 7.1. NatureServe, Arlington, Virginia. O Hare, N.K. &Dalrymple, G.H. 1997. Wildlife in southern Everglades wetlands invaded by Melaleuca (Melaleuca quinquenervia), Bulletin of the Florida Museum of Natural History 41(1): pp. 1-68. Summary: In the Everglades region of southeastern Florida, invasion of graminoid/herbaceous wetlands by the invasive, non-native tree melaleuca (Melaleuca quinquenervia) results in a closed-canopy forested wetland, with a sparse understory. Intermediate stages in this transformation include a savannah with scattered mature melaleuca trees, and mature dense melaleuca heads surrounded by areas with moderate to low levels of melaleuca. Intermediate levels of melaleuca invasion have not received any attention and were the rationale for our study. Wildlife was surveyed monthly for two years to determine species richness and abundance in wetlands with different melaleuca coverages. Wildlife included all vertebrate classes, as well as selected macro-invertebrates such as crayfish (Procambarus alleni) and grass shrimp (Paleomonetus paludosus). Species richness was highest in areas with moderate melaleuca coverage. Higher species richness is typical of sites with greater vegetative structural diversity, i.e., as in the savannah stage of invasion, as well as areas in an early stage of disturbance. The higher species richness was primarily the result of an increased number of migratory, upland birds. Many of these transient and winter-resident birds occurred at much lower abundances than in native forested habitats such as cypress swamps (Taxodium distichum), tropical hardwood hammocks, and pine (Pinus elliottii var. densa) rocklands. In contrast to the birds, number of species and the abundance of herpetofauna varied little across the melaleuca gradient. There was no shift in species composition from wetland to upland species as the melaleuca coverage increased. The number of fish species was similar across the melaleuca gradient. Unlike the herptiles, fishes were less abundant in the closed-canopy melaleuca forests, indicating poorer habitat quality. Complex patterns of hydrology and gapping in the forest canopy due to wind storms and fires permitted light penetration and the persistence of productive pockets of aquatic life even within dense stands of melaleuca. The mosaic of areas with low to moderate infestations of melaleuca surrounding mature dense melaleuca stands allowed higher numbers of individuals and species to persist in or seasonally use mature dense melaleuca stands. This interspersion of habitats resulted in stands of melaleuca with ecotonal edges that provided marginal habitat for species characteristic of natural communities. Higher degree of interspersion (more edge) may also mean that the natural areas experience higher exposure to melaleuca seed source, which may result in a faster rate of spread of melaleuca. The results demonstrated that animal populations persisted in areas with disturbed vegetation, as long as critical abiotic factors (in this case hydrology) remained in operation. Areas with moderate levels of melaleuca retained species composition and productivity typical of the natural wetland community. The dominant characteristic of the faunal shifts along the gradient of increasing melaleuca coverage was increased numbers of upland, arboreal, and/or forest species, not the loss of wetland species. Regional permitting and natural resource agencies should recognize that lands with moderate levels of melaleuca may retain significant habitat quality. Restoration of such lands will demonstrate higher levels of success if the method used for melaleuca removal allows for retention of the in situ wildlife community. Porazinska, D.L., Pratt, P.D. & Giblin-Davis, R.M. 2007. Consequences of Melaleuca quinquenervia invasion on soil nematodes in the Florida Everglades, Journal of Nematology 39(4): pp. 305-312. Pratt, P.D., Quevedo, V., Bernier, L., Sustache, J. & Center, T.D. 2005b. Invasions of Puerto Rican wetlands by the Australian tree Melaleuca quinquenervia, Caribbean Journal of Science 41(1): pp. 42-54. Pratt, P.D., Rayamajhi, M.B., Silvers, C.S. & Ferriter, A.P. 2007. Naturalization and biomass allocation of the invasive tree Melaleuca quinquenervia in wetlands of the Bahamas, Journal of Aquatic Plant Management 45: pp. 8-16. Pratt, P.D., Rayamajhi, M. B., Van, T.K., Center, T.D. 2004. Modeling the influence of resource availability on population densities of Oxyops vitiosa (Coleoptera: Curculionidae), a biological control agent of the invasive tree Melaleuca quinquenervia. Biocontrol Science and Technology. 14(1): 51-61. Pratt, P.D., Rayamajhi, M.B., Van, T.K., Center, T.D. & Tipping, P.W. 2005a. Herbivory alters resource allocation and compensation in the invasive tree Melaleuca quinquenervia, Ecological Entomology 30(3): pp. 316-326. Ramanoelina, P.A.R., Bianchini, J.P. & Gaydou, E.M. 2008. Main industrial niaouli (Melaleuca quinquenervia) oil chemotype productions from Madagascar. Journal of Essential Oil Research, 20: 261-266. Rayamajhi, M.B., Pratt, P.D., Center, T.D., Tipping, P.W. & Van, T.K. 2008b. Decline in exotic tree density facilitates increased plant diversity: the experience from Melaleuca quinquenervia invaded wetlands, Wetlands Ecology and Management: pp. 1-13. Rayamajhi, M.B., Purcell, M.F., Van, T.K., Center, T.D., Pratt, P.D. & Buckingham, G.R. 2002. 8. Australian Paperbark Tree (Melaleuca). In Biological control of invasive plants in the Eastern United States. R. G. V. Driesche, B. Blossey, M. S. Hoddle, S. Lyon, and R. Reardon (Eds). Pp. 117-130. Morgantown, West Virginia: Forest Health Technology Enterprise Team. Rayamajhi, M.B., Van, T.K., Pratt, P.D. & Center, T.D. 2006b. Temporal and structural effects of stands on litter production in Melaleuca quinquenervia dominated wetlands of south Florida, Wetlands Ecology and Management Volume 14(4): pp. 303-316. Rayamajhi, Min B., Van, Thai K., Pratt, Paul D., Center, Ted D. & Tipping, Phillip W. 2007. Melaleuca quinquenervia dominated forests in Florida: analyses of natural-enemy impacts on stand dynamics, Plant Ecology 192(1): pp. 119-132. USDA-ARS. 2009. Taxon: Melaleuca quinquenervia (Cav.) S. T. Blake National Genetic Resources Program. Germplasm Resources Information Network - (GRIN) [Online Database]. National Germplasm Resources Laboratory, Beltsville, Maryland. Van, Thai. K., Min, B. Rayamajhi & Ted, D. Center. 2005. Seed Longevity of Melaleuca quinquenervia: A Burial Experiment in South Florida, J. Aquat. Plant Manage 43: pp. 39-42. Van, T.K., Rayachhetry, M. B. & Center, T. D., 2000. Estimating above-ground biomass of Melaleuca quinquenervia in Florida, USA, Journal of Aquatic Plant Management 38: pp. 62-67. Wagner, W. L., Derral, R. H. and Sohmer, S. H. 1990. Manual of the flowering plants of Hawai i: 373-374. Wilson, P.G., O�Brien, M.M., Heslewood, M.M. & Quinn, C.J. 2005. Relationships within Myrtaceae sensu lato based on a matK phylogeny. Plant Systematics and Evolution, 251: 3-19. Woodall, S.L. 1981. Site requirements for melaleuca seedling establishment. In: Geiger, R. K., comp. Proceedings of melaleuca symposium; 1980 September 23-24; [Location unknown]. Tallahassee, FL: Florida Division of Forestry: 9-15.